Synopsis: Simon Snow just wants to relax and savour his last year at the Watford School of Magicks, but no one will let him. His girlfriend broke up with him, his best friend is a pest and his mentor keeps trying to hide him away in the mountains where maybe he'll be safe. Simon can't even enjoy the fact that his room-mate and longtime nemesis is missing, because he can't stop worrying about the evil git. Plus there are ghosts. And vampires. And actual evil things trying to shut Simon down. When you're the most powerful magician the world has ever known, you never get to relax and savour anything.Based on the characters Simon and Baz who featured in Rainbow Rowell's bestselling novel Fangirl, Carry On is a ghost story, a love story, a mystery and a melodrama. It has just as much kissing and talking as you'd expect from a Rainbow Rowell story - but far, far more monsters. Harry Potter has become such a large part of our cultural consciousness that Rainbow Rowell’s obvious spoof is brilliant in and of itself. Irreverent and tongue-in-cheek, Carry On has its own kind of heart that makes this pastiche a warm novel you can’t help but smile about. Off to a slow start, Carry On takes its time establishing the conflict between Simon – our Chosen One – and roommate Baz – a vampire. It’s a conflict that – allegedly – spans every year since they started at Watford School of Magicks, but is never really explained and doesn’t make altogether much sense. Still, if you’re willing to accept this Taming-of-the-Shew style romance-come-rivalry you’ll be rewarded with 10 Things I Hate About You, gay wizard style. Talking of gay, let’s discuss the LGBT development of Baz and Simon. It’s nice to see a novel that is driven more story than by sexuality – contemporary coming out novels still dominate LGBT fiction, and Carry On is realistic without dwelling or relying on the drama of coming out to drive its narrative. That being said, Simon’s slow awakening to his sexuality is somewhat…well, slow: apparently it’s obvious to everyone except him and the will-he-won’t-he drags its heels a little too long. Carry On’s delight is more comic than it is dark, choosing to gently jibe the world’s bestselling children’s series. 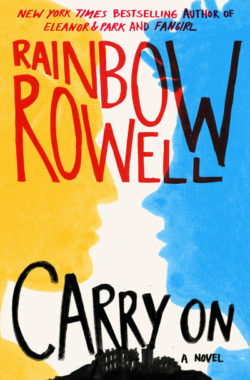 It’s necessarily self-conscious, and Rainbow Rowell never takes herself too seriously. It’s safe to say that Carry On manages to find its own magic along the way, establishing a world that moves beyond just mirroring Harry Potter.